Astrophotographer Gerald Rhemann captured this image of comet C/2018 Y1 Iwamoto on Feb. 9, 2019. The brilliant, blue-green comet C/2018 Y1 Iwamoto will zip by Earth this week, and the speedy space "snowball" is currently visible in the night sky with binoculars and small telescopes. Discovered just two months ago by amateur astronomer Masayuki Iwamoto, Comet Iwamoto is an icy body that orbits the sun in a highly elliptical path that takes 1,371 years to complete. After this encounter, the comet won't be back until the year 3390, so check it out while you can! Comet Iwamoto made its closest approach to the sun — a point in its orbit known as perihelion — on Feb. 7, when it swooped around our star at a distance of 26 million miles (42 million km). You can see Comet Iwamoto's path around the sun in the orbit animation above. 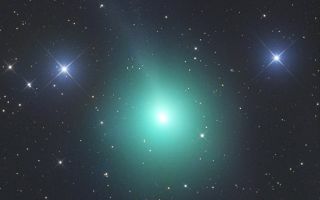 The comet is now visible in the evening sky with binoculars and small telescopes, and the best times to look for it will be on Tuesday and Wednesday nights (Feb. 12 to 13), according to the skywatching site EarthSky.org. After this close approach, comet watchers will need more powerful telescopes to keep an eye on the comet as it fades out of view on its way back out to the farthest reaches of the solar system. Comet C/2018 Y1 Iwamoto approaches the constellation Leo on Feb. 9, 2019 in this animated view by astrophotographer Gerald Rhemann. According to Spaceweather.com, Comet Iwamoto belongs to a class of solar system bodies known as Extreme Trans-Neptunian Objects, which come from the distant outskirts of the solar system. These objects are at least five times as far away from the sun as the dwarf planet Pluto. "Shining with an astronomical magnitude of +6.5, the comet is invisible to the unaided eye. Nevertheless, it will be an easy target for backyard telescopes in the nights ahead as it glides through the constellation Leo the Lion high in the midnight sky," Spaceweather.com reports. To track Comet Iwamoto's position in the night sky, check out this finder chart from In-the-Sky.org. Editor's note: If you have an amazing comet photo you'd like to share with us and our news partners for a possible story or gallery, please send your images and comments to spacephotos@space.com.